There are just some desserts that remind you of Spring! 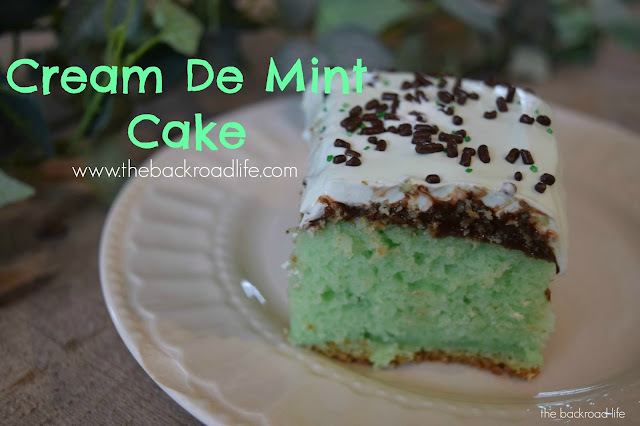 This Cream DeMint Cake is a great kick off to Spring and is perfect for St. Patrick's Day as well. 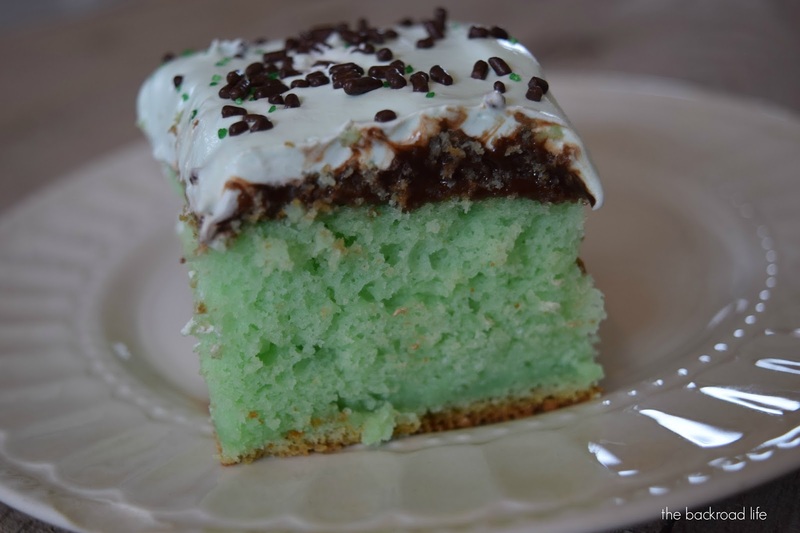 I always remember my mom making this dessert and taking to work on St. Patrick's Day. We worked at the same facility for several years so it was always a nice treat I looked forward to her making. She also took it to our Easter get togethers with family. It's a nice blend of flavors of mint, chocolate all together in a cake with a gooey and fluffy topping. As St. Patrick's Day arrives, we are also reminded that Spring is well on its way and coming soon. We have our one cold frame planted with transplants and have seeds growing. We have been wanting to put up a second cold frame, so we have been working on that. 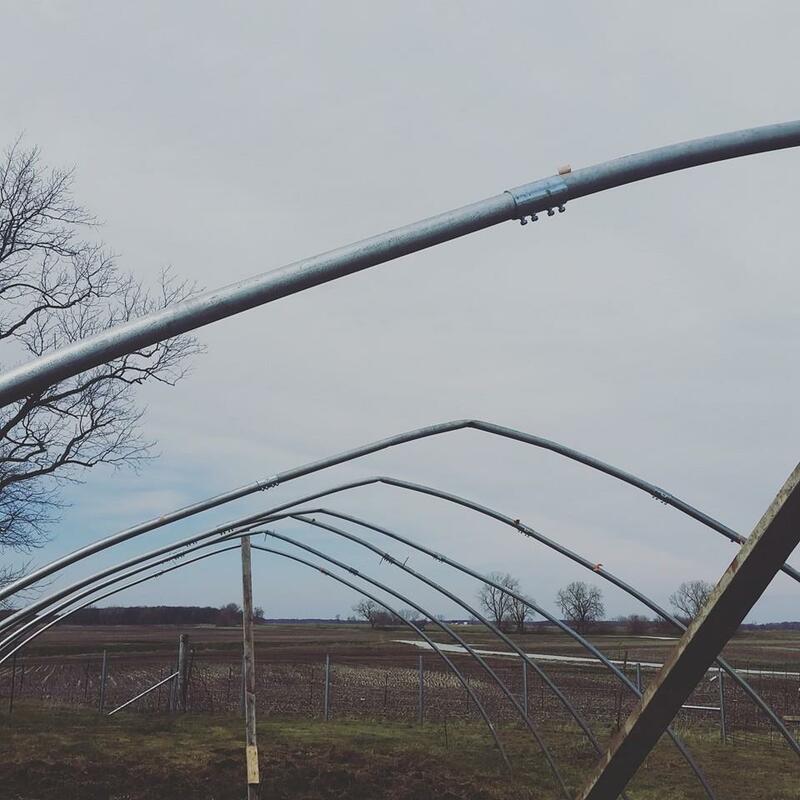 Our larger cold frame is housing early cold crops. We have lettuce, spinach, arugula, green onions etc planted in there to give our growing season a head start. This new cold frame, a little smaller, will house our peppers and tomatoes to give us a head start to growing them only outside. By growing some tomatoes and peppers in the cold frame, it gives us tomatoes ready to pick about a month or two ahead of planting them just outside. 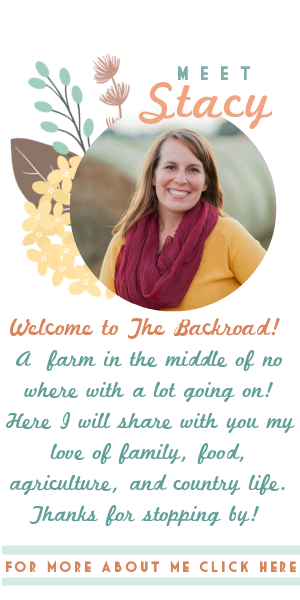 We are looking forward to getting it up and planted. 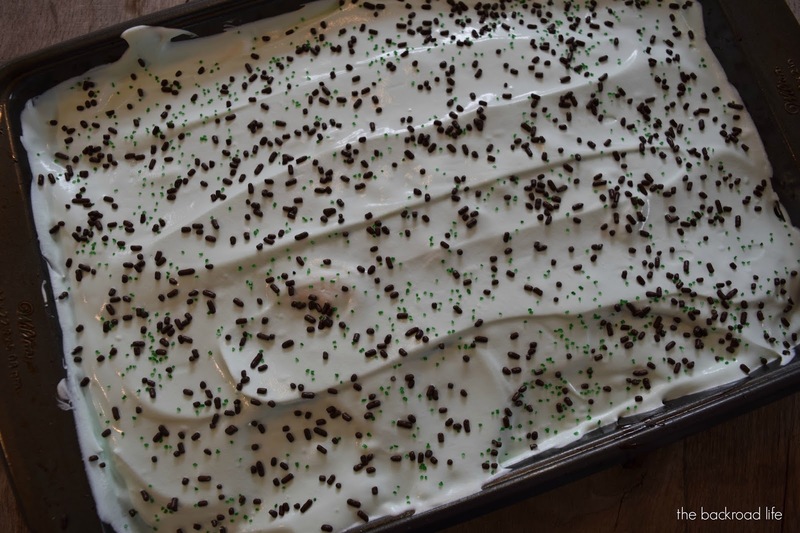 Sprinkles or chopped Andis mints for topping. Mix cake batter as directed on box with the mix, eggs, oil, and water. Add 1/4 cup of Creme de Menthe to the batter. Bake cake as directed on box. 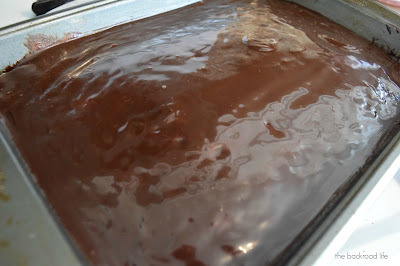 After cake is done, pour 1 can of Hershey chocolate fudge topping over top of cake and spread evenly while cake is warm. 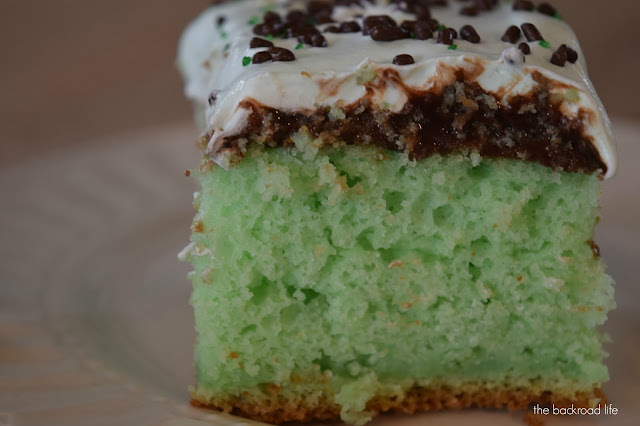 For the topping, mix 1 12 Oz container of cool whip with 1/4 cup of Creme de Menthe and spread evenly over top of cooled cake and chocolate. Add sprinkles or crushed mints to top. 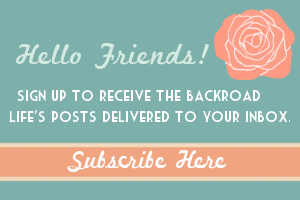 Take to work to share with coworkers or keep at home for yourself and family. 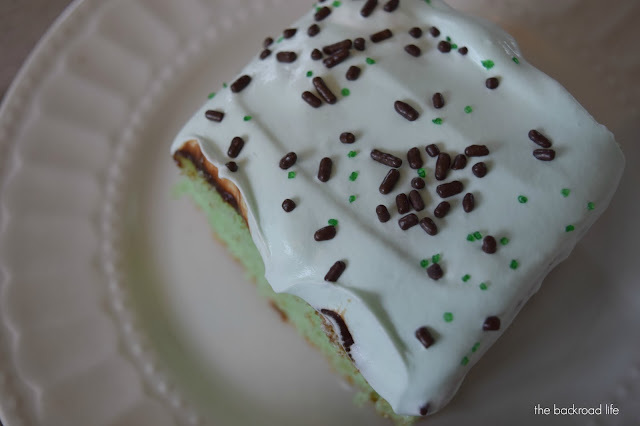 It's a great dessert to enjoy anytime of the year, but especially in the Spring and definitely for St Patrick's Day!